I am literally catching some air before started writing this because even after hours, still the intensity is alive the tension is huge and the fear on people who vows to save mankind, fight against crime is growing like a magic beanstalk. 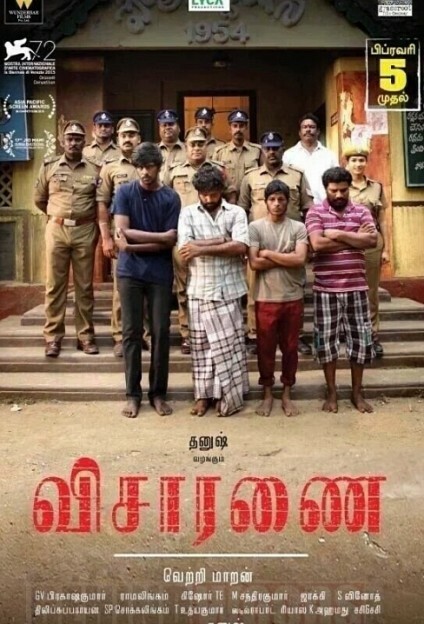 Vetri Maaran's Visaranai follows a novel 'Lock-Up' written by one of the victim himself. Interesting fact is, the whole novel was till the first half alone and the second half was Vetri Maaran's groundbreaking study on a system which was supposed to protect the people. Vetri Maaran's view on brutality is the real deal here which got showcased in the second half in a different manner and with that Vetri's love on betrayal continues. The movie starts with character introductions but not their background and then he takes us along deep in to that colossal interrogation that takes place in Andhra. There was no information on what has happened in the beginning but slowly you will came to know the motive of police is to make a bunch of Tamil people to accept a crime mainly because the person who involved in that crime was a Tamil speaking guy. The movie takes you to a ride of beatings, blood spilling and unimaginable ways of torture. Even the viewers can feel the pain from every hit that connects; the main reason is like the characters, the viewers also have no idea on what is happening. Second half of the movie is like a slow steady poison where the characters in power struggles to cope with their master-plan and finally ending up wiping out everyone involved in it. The dialogues were influential especially the conversation between Kishore and Samuthrakani, this particular scene is kind of a brainwash to the audience also. Editing was good and the biggest plus is the BGM from GV, as per Vetri Maaran’s interview the music of the film was mainly focused on slowing down the intensity. Cinematography needs a special mention, there is no big outdoor location, the movie mostly shot in closed areas and lots of long shots which were perfectly captured and the lightings synched extremely well. Realism of a movie always depends upon the realistic performances of the actors and Visaranai was blessed with actors who can surrender themselves completely. Huge responsibilities for Dinesh and he just killed it, watch out for the scene where he broke himself for his friends and the last hope of pleading in the courtroom, he lifts the scenes with his mature performance. The cast includes brilliant Kishore and Samuthrakani who were the major characters in the second half. Nowadays it’s tough to find movies without Samuthrakani, if he is not his voice will be there to represent someone else and the struggle on struck in between higher officials has been handled with ease. The supporting cast did their part well, Aadukalam Murugadoss provides some good laugh in between. The actors who performed as cops were so absolute especially two characters from Andhra and Tamil Nadu police, who speaks like they really care but they are the most cunning among the rest. Among other characters the guy who played Afsal was really good. Only two female characters and a small love portion, which is like a small warm up session before the collateral damage begins. Vetri Maaran's take on betrayals is getting enhanced every time and his screenplay mixed along with the shades of real controversial encounter which was held in 2012 and it's for some bank robbery, more than 5 north Indian men were killed in that incident. There were no clear resemblance but the climax tries to replicate the same. After Aadukalam, Vetri Maaran took immense time for his comeback but with this adaptation he makes us forgive him. The fear on approaching a cop is slightly increased and that is the truth. Movies are not only the medium to amuse the audience but to educate. Vetri Maaran and his act on betrayal, best thing ever happened in Tamil Cinema. This page has information about Vetri Maaran and his art on Betrayal - Visaaranai.